Many homeowners are constantly looking for ways to increase the beauty and functionality of their homes while also adding value. One way to accomplish this goal is with a sunroom. Sunrooms are becoming increasingly popular and for good reason. There are a number of benefits to a sunroom. Let’s take a look at a few of the reasons this might be the right move for your home. A sunroom looks great and increases the value of your home. Here’s why. Sunrooms are perfect for brightening a dim space. They are largely made of glass, thus the natural light can make even a small room look significantly larger. Sunlight also brightens the mood of a home, and this is a great space to sit and enjoy your coffee first thing in the morning or to watch the sunset after dinner. A sunroom is not only useful, but it’s also aesthetically pleasing. This is a part of the house that automatically draws your attention to it. Adding a sunroom quickly transforms your home into a structure that is more eye-catching and exciting. 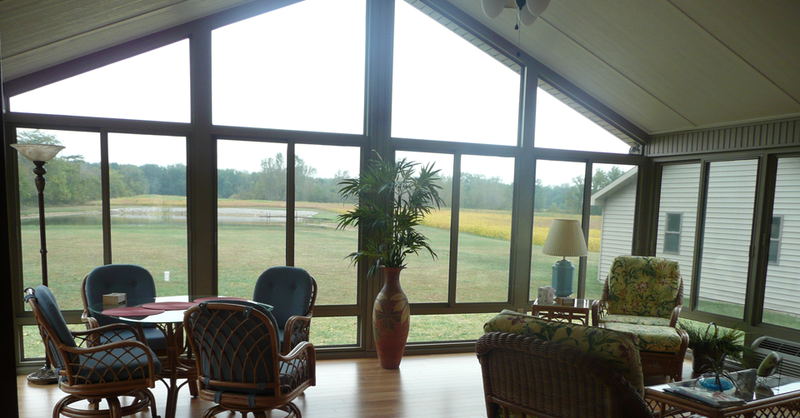 Adding a sunroom is a way to instantly increase your home’s value. More and more people are beginning to understand the appeal of this kind of space, both for personal enjoyment and financial benefits. And because of this appeal, a home with a sunroom will attract more potential buyers when the time comes to put the house on the market. Because of the natural light, sunrooms require very little if any energy to heat during the winter. And modern materials used in the construction of these spaced are extremely energy efficient, helping to warm the rest of the home. Let’s not forget about the view. Often times while sitting inside we often forget about the beautiful backyard! Not the case with a sunroom. After all, a sunroom is all windows, allowing you to sit back and soak up the outdoor view without leaving the comfort of your climate-controlled home. This space can be used for anything from a home office, breakfast nook, game room, greenhouse, as a workout area, and on and on. There’s really no limit to the possibilities. Because the room is mostly windows and constructed of extruded aluminum, keeping your sunroom looking great is easy and practically maintenance-free. No painting is ever required! A sunroom is one of the best ways to take the look of your home to the next level. With so many uses, you’ll wonder how you ever lived without one! After all, your home is your place of solace, where you go to recharge and there’s no better place to relax and let go of stress than a bright and beautiful sunroom. Ready to build a sunroom on your home? Contact W.A. Zimmer today to schedule a free in-home estimate. One of our designers will come to your home, take a look at your space, discuss options, measure, and give you a free, no-obligation estimate. Need help furnishing your new sunroom? View 5 tips for furnishing a sunroom.